This is her first book of poems. Winner of the Pavement Saw Transcontinental Award for 2005-2006. Hip, funny, moving and at times bizarre, this first outing from the Yonkers, N.Y.based Simon stitches together the elegiac with the entertaining, the fragmentarily outré with the clearly autobiographical: they make an attractive weave. The poems (almost all shorter than one page) include, as she phrases it, "getting-to-know-you-games," multiple tributes to summer camp and "family funerals." Several elegies appear to lament the friend and writer, dead at 21, to whom Simon dedicates the book. "Neither bitter nor embittered,/ non-eponymous but partially self-referential," Simon is also partial to self-portraits composed in apparently unrelated sentences; to in-jokes against writing-workshop platitudes ("No surprise for the writer,/ no surprise behind door number three there is never a car"); and to baffling one-line quips ("My blood is completely cheese"). She can wring comedy from nostalgia, and nostalgia from the detritus of modern childhood: "I hoped that/ by sending a box of twinkies/ you'd remember to remember me." Yet her flirtatious advertisements for herself double as postmodern queries into the dangerous culture of advertising, where men and women risk disappearing unless they find something new to say. "Sometimes in floods, sometimes in careful ministrations, Theory of Orange salvages for us consolations where it can, in the humor of mock-authority and in the humility of grief and hope. 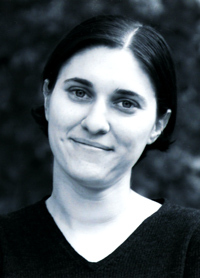 In a language that ranges from the securities of instruction and structural regularity to plaint and improvisation, where the nightmarish vies with slapstick, Rachel Simon's poetry springs from a truly charitable spirit of revelation." 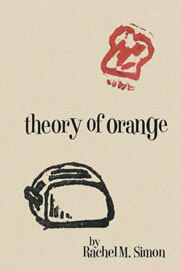 "In Theory of Orange, Rachel Simon aims her clear-eyed gaze at life’s odd, irresolvable circumstances and “tells it slant.” Simon’s poems sparkle with freshness, verve, and above all, humanity. Understated wit, wry intelligence, and honed language are hallmarks of this decidedly original first collection." "Improvisation" is a quintessential Poem of Our Moment: fast moving and declarative, wobbling on the balance beam between associative and dissociative, somewhat absurdist, and, indeed, cerebral. Much talent and skill are evident in it's making, in its pacing and management of gaps, the hints and sound bites which keep the reader reaching forward for the lynchpin of coherence. One admirable aspect of the poem is the way it seems capable of incorporating anything... even as the poem implies a world without sequence, the poem itself has no consequence, no center of gravity, no body, no assertion of emotional value. Poems like "Improvisation" showcase personality in the persona of their chatty, free-associating, nutty smart narrators. It is a self that does not stand still, that implies a kind of spectral, anxious insubstantiality. ... Speed, wit, and absurdity are its attractive qualities.